But if the red-white-and-blue barber’s pole is twirling, you know his silver F-150 is parked by the side of the khaki concrete-block building on North West Cherry Street Alley. 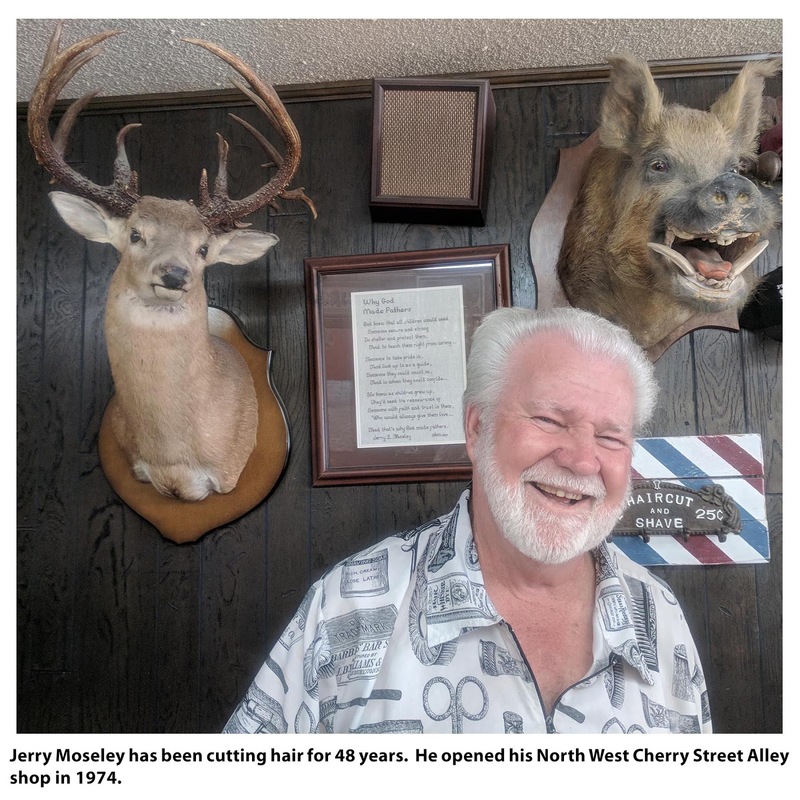 And if you’re the first in the door—after 6 a.m.—you’ll probably find Jerry Moseley in the front barber’s chair, reading his Bible. Jesup’s dean of barbers and I go back—way back—to high school, Class of 1966. If you were a first-timer in Jerry’s shop, you might do a double-take. With his silver hair and beard, you might mistake him for Kenny Rogers. Two clues tell you otherwise. Jerry hasn’t had a passel of plastic-surgeon visits. And while Jerry’s voice is country—like most of us from around here—you can tell he’s not the one who sang “The Gambler” or “Islands in the Stream” with Dolly Parton. Still, he’s as famous to his customers as a barber can be. When you walk into Jerry’s, you know what to expect. He’ll put a vise-grip shake on your hand and call you by name. After 48 years of “lowering ears” in our hometown, he can laser-quick match names with faces. The décor tells you plenty about the man who is about to cut your hair. With a wild-boar head and a trophy-buck head mounted over the row of seats along the east wall, you know he’s an outdoorsman. 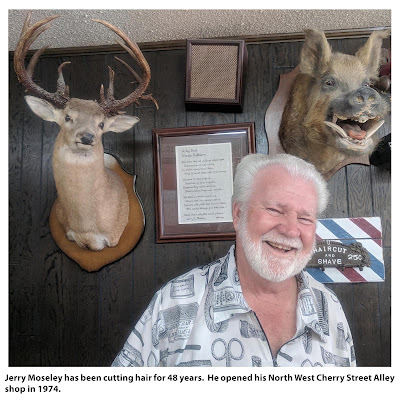 Gobbler beards and fish—which have passed through the hands of a taxidermist, too—are further testament to where you are likely to find Jerry on his days off. That is, if his wife, Charlotte, or the rest of his family don’t need him. Jerry loves his profession and the people who sit in his chair. And you don’t have to be seated there long to know how much his family and Lord mean to him. In another life, Jerry could have “made a preacher.” He is not bashful about his faith, and he’s apt to launch into a 90-second sermon. Pithy quotes and pictures fill the walls inside his booth. Besides the river-swamp cypress with century-old ax marks on it, my favorite picture is of the spotted mule—a rock-star mule, if I do say so. Jerry’s place is a mini-museum of piney-woods turpentine tools. I’m always surveying the decorations for new additions. Monday morning, I noticed someone had brought him a jar of honey. I made a note to take him some tupelo honey from our swamp. Since we’ve been friends for more than 50 years, Jerry knows plenty about me, too. He shares my passion for our natural resources. That’s why he waited to tell me about Macon’s 4-millon gallon spill of raw sewage into the Ocmulgee River. “You know where that’s headed don’t you?” he said. Of course, I know. Stuff runs downhill, right past Jesup in the Altamaha and on to the coast. Jerry could feel the tension rising in my neck, so he knew what to do. The cherry-on-the-top of a visit to his shop is the vibrating massage to your neck and shoulders. Over the electric rumble, I said, “Hey, Jerry. How about bringing this thing to my office about three times a day?” He laughed, and the fellas in the on-deck seats—below the boar and buck heads—chuckled, too. Yeah, I like it when I see Jerry’s barber’s pole twirling in the early-morning light. I know that I’m about to get more than a good haircut.